Four varieties of Sake poured during a Sake Pairing event at Kizuki Ramen in West Seattle. They each offered differences in body, flavor, bouquet and alcohol content. A fifth one was also shared more as a specialty or dessert style Sake. You may have tried the japanese beverage called Sake (Sock-A) before and possibly thought of it as only specialty drink, or a one-off experience. But that's only because it's a beverage with more sophistication and subtlety than a single taste can explain. It's sometimes referred to as "rice wine" but it is not a wine at all. In fact as the people at Kizuki Ramen explained it is more akin to beer.The best varieties are made by first polishing a very special kind of rice called shuzō kōtekimai 酒造好適米 referred to as "pearls of simplicity" although there are more than 80 types of rice used for Sake. Then only three other ingredients are used; Water, Koji (a kind of yeast), and sometimes Brewers Alcohol (added to extract flavors otherwise left behind). The process of polishing to different degrees shapes the flavor from mild to strong and the alcohol content will vary from roughly 12 percent to 17percent. One dessert variety is only 5 percent but also contains gelatin and is sparkling. Sake as a drink has a very long history dating back to the years 710–794 making it more than 1300 years old. Kizuki Ramen, began in 2012 and has fifteen locations in Japan, seven in Washington State, two in Chicago, and one each in Indiana, Oregon and even Australia. They specialize in Ramen or Japanese noodles but serve a wide ranging menu including gluten free and vegan options. Westside Seattle was part of a test Sake Pairing event at the West Seattle location at 42nd SW and SW Alaska Street in which four varieties were paired with food. As Cem Tunk, Assistant District Manager for Kizuki and our host explained, the fat content of the food was paired with the types of Sake. Lighter flavors with vegetable offerings and heavier with meat and heartier broths. The Sake was served in tiny cups, enough for a good taste. They plan on offering the events to the general public starting July 11. The cost will be $35/person, with ten seats available.. They will offer it monthly on Wednesdays. To book your seat at an upcoming pairing event email WestSeattle@Kizuki.com . Edemame: Japanese word Edemame translates into “Stem Bean”. A Japanese appetizer boiled in hot water for a short amount of time and seasoned with salt. Spinach Gomae: This traditional Japanese side salad is loaded with spinach and bathed in a nutty sesame dressing. Hakutsuru Junmai Ginjo: The rice is 60% polished (so 40% of the outer grain has been removed). 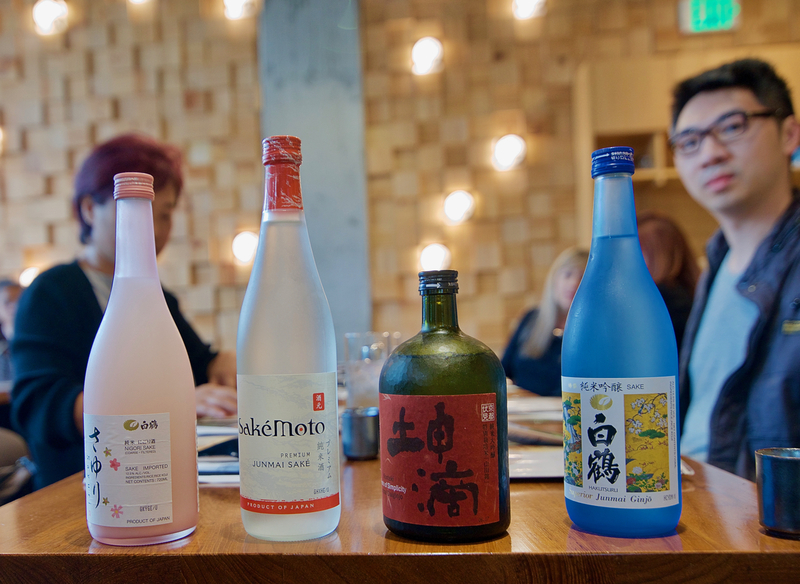 Junmai indicates that the sake has no added alcohol, its ingredients are just water, rice, koji and yeast. Chilled tofu Shoyu: It’s a cold tofu salad with some toppings and soy sauce. It’s a fresh and cold, and perfect for the summer. Gyoza: A mixture of ground pork, chicken, and vegetables stuffed into gyoza wrapper. Steamed and pan fried to be crisp and soft to taste at the same time. Japanese gyoza is very similar to Chinese potsticker, with the biggest difference in the size and thickness of gyoza wrappers. Yuzu Shio Ramen: A clear broth soup-based ramen with a hint of citrus and French sea salt. Konteki Junmai Daiginjo: The rice is 50% polished, the The rice used in this sake is called Yamada Nishiki. It’s an ideal sake rice because of its structure, it tends to be bigger and have a higher starch. This sake is called Pearls of Simplicity because when the rice is polished its looks like tiny pearls. Its flavor is round and smooth and highlights the rice used. The brewery that makes this sake is very small – only 5 people make this sake. Shrimp Tempura: Lightly battered shrimp deep fried with authentic Japanese technique. Geso Karaage: Lightly coating squid with a seasoned corn starch and frying in a light oil. Diced octopus mixed with sweet potato baddered with wheat floud, shaped into little balls. Deep fryed and topped with Japanese mayo, okonomiyaki sauce, powdered sea weed and bonito flakes. Moto Junmai: This is a junmai sake, it does not have a minimum polish requirement. It is made from only 4 ingredients – rice, water, koji and yeast. Moto means one in Japanese. Since it is low polish, it tends being earthier and almost densier on the palate, it stands up to heavier foods like the ones we’re about to enjoy. Chicken Karaage: Hand trimmed chicken thighs, cut into two bite sizes, marinated for 24 hours. We batter them with corn starch and deep fry them twice to create the juicy inside and crisp outside. Served with spicy Japanese mayo. Tonkotsu Shoyu Ramen: A flavorful broth, made with roasted pork bones to eliminate any smell. Served with special Kizuki noodles. Topped with bean sprouts, bamboo shoots, green onions and mayu. Also served with soft boiled and marinated egg and pork chashu. We roast our pork chashu, roast it, marinade it and slice it to think pieces. We grill it with our secret house sauce to give it the smoky flavor before serving. Sayuri Nigori Sake: Sayuri means “little lily” in Japanese and the name is apt for this soft, floral noted nigori. Hints of white grape and elements of cherry blossom. Mochi Ice Cream: Pounded sticky rice with flavored ice cream filling, was invented by Japanese-American business women and activist Frances Hashimoto. Ikezo Jelly Sake: Jellied sake with sparkling bubbles and carbonation.